Maximize performance during periods of heavy traffic. Lucky Guest Prize - Just For You! Bring home this grand prize when you sign up for any annual plan.XiaoMi Bluetooth Soundbar will be yours! Managed linux dedicated server is designed to maximize the performance on handling heavy traffic workload. Exabytes managed linux dedicated server has gone through the reengineering process to serve your customers at blazingly fast speed together with reliable uptime. 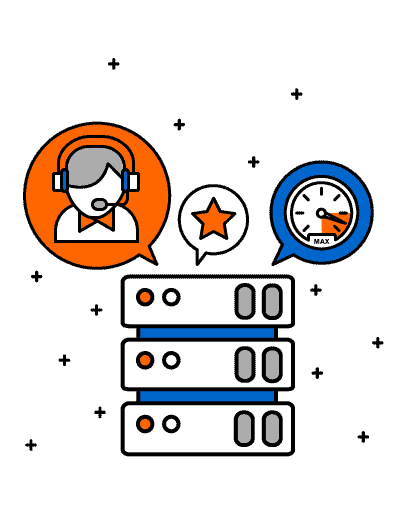 Get rid of the hassle of managing and maintaining your server by choosing Exabytes, and Enjoy 24/7/365 dedicated professional support. With high performance, reliability and full redundancy, our servers are designed to exceed your business needs. Looking Special Spec or Discount? Let us know what type of server works for you, and we will get in touch with you soon. We offer high-performance dedicated servers that can ensure maximum availability of your website. Daily off-server backup for 14-Day Retention Period by Idera R1Soft. First-Grade network-based DDoS Mitigation and strong protection with 24×7 monitoring. Exabytes Data Centre is designed to meet the stringent demand of web hosting customers. Manage your Linux dedicated server with just 1-Click. With Plesk Onyx control panel. No programming skills are needed. Full control and functionality over your websites, domains, emails, files and many more all with the cPanel. The HIGH-PERFORMANCE server optimized and greatly improved, as you don’t share your resources with others. A Dedicated Server gives you excellent reliability and HIGH AVAILABILITY. Our server hosting comes with 14-Day Retention Daily off-server backup by Idera R1Soft. You can even prolong the retention period up to 60 days with additional addons. You have more RESOURCES when you need and it won’t be worry on sharing bandwidth and disk space with other websites users. You are in charge and in CONTROL. You make all your hosting decisions. Enjoy unprecedented support with our Managed Linux Dedicated servers, with our readily-available 24/7 Dedicated Support team for your server’s storage, performance and hardware administration. 6 hours’ hardware replacement guarantee, to ensure that your servers are up and running up again. It’s your server now; you will have root-level access allowing you to install anything and everything you require to power your website. Why Exabytes Managed Dedicated Server? Our powerful servers come with fast processors and RAM – giving your website the ability to handle heavy workload. Always troubled by a sudden surge in your website traffic? Say good bye to this problem as now you’ve got 100Mbps shared bandwidth which is more than enough for a large amount of traffic! We understand that efficiency is the key to success in today’s digital world. When you purchase online, your server will be ready after just 4 Hours of Lighting-Fast Setup. Your server is being monitored 24×7 by our professional servers’ engineers. All your problems will be diagnosed and solved swiftly. Our Managed Dedicated Server hosting comes with PREMIUM Dedicated Support. We provide technical support via Email, Live Chat, and Remote Access Help. Will I get root access to my own server? Yes. You will have the root access and total control of your own server. Your server will be hosted in Exabytes Data Center, the award-winning data centre. How long does it take before my server can run in full action? It depends on the dedicated server package that you purchase. Instant dedicated server will be ready within ONE working day (terms and conditions apply) whereas other dedicated server setup will take 3 – 14 working days depending on the hardware availability. If I have complete control of my server, can I have adult content in my website? Yes. But the adult contents need to be legal. Yes. We offer Free 24 x 7 x 365 First Level Technical Support. Our support team is working on shifts 24 x 7 x 365 including public holidays and is ready to assists you any time. Our Support Team can be reached by creating a Helpdesk Ticket at http://support.exabytes.com.my/. How can I maintain the server? You will be given a Remote Desktop login for Windows server and SSH Login for Linux server. Can I visit the data centre for application maintenance? Yes. However, you may need to give 24 hours notice in advance prior your visit to the data centre. Who should be held responsible should there be a hardware failure? Exabytes will take full responsibility and replace all hardware failures (if any), free of charge. Can I own the server after hosting it for a certain period? No. The server is owned by Exabytes. Building the IT infrastructure to support your application can be very costly when you factor in hardware and software costs, knowledgeable staff, environmentally controlled facilities and daily maintenance, let alone setting up an Internet backbone that ensures reliability and uptime for your customers. An Asia’s renowned data center that is situated in Malaysia’s intelligent city, Cyberjaya. It has multiple backbones from Tier III ISPs which allow global reach and fantastic QOS. It is the only IP transit service in Malaysia that provides SLAs. Connected with good latency to major destinations worldwide and an estimate of 0.01% packet loss rate across the network. Researching IT vendors and platforms takes time and resources, and setting it up and testing it all takes even more. With Exabytes Dedicated Server, you get a highly reliable platform with the computing power you need to deliver your software services to market more quickly. Besides that, by employing skilled manpower in larger numbers at lower costs companies can really increase their productivity. This in turn would result in better customer satisfaction and increased profitability. By outsourcing your Dedicated Server, it gives a company the ability to get access to skilled and trained man power at extremely low rates. This in turn leads to an increase in productivity as well as cost savings. Exabytes Dedicated Server offers you with real time information about your bandwidth usage through MRTG graph. Exabytes Dedicated Server’s MRTG graph gives you FULL visibility of your server’s traffics. What is MRTG? The Multi Router Traffic Grapher, or just simply MRTG, is free software for monitoring and measuring the traffic load on network links. It allows the user to see traffic load on a network over time in graphical form. What is KVM Over IP? KVM Over IP (Keyboard, Video and Mouse Over IP) gives you the ability to remotely access your servers if you were right in front of your system. You get 100% control over your system even if your server’s internet connection is not working. This enables you to remotely reboot your server, get direct console access, re-install your operating system, troubleshoot your server, access your bios, watch your server boot-up and much more. Lucky Guest Prize is applicable for new registration only. Additional promotion price on our pricing table applicable for new signup only. For renewal, the price will be reverted to default price. This promotion is valid until 28 February 2019. Pricing include 1st Level Technical Support (reboot & remote assistance). 4 hours setup time guarantee only applies to business hours. Server will be hosted in Exabytes Data Center. 80% of the bandwidth 100Mbit/s of Internet Connection is allocated for Local (Malaysia) access while the remaining 20% is allocated for International access. Instant Dedicated Server only available for CentOS(64bits) and Windows Server 2012 Standard Edition(64bits). Service cancellation need to be made 30 days in advance.